April 17th marks an important date in the world of Automotive History. It is the day the Ford Motor Company introduced what would become one of the most legendary marques to ever grace the face of the earth. We of course, are talking about the Ford Mustang. The Ford Mustang though, brainchild of automotive marketing legend Lee Iacocca did not just start a revolution in automotive design, it set all sorts of benchmarks in sales too. 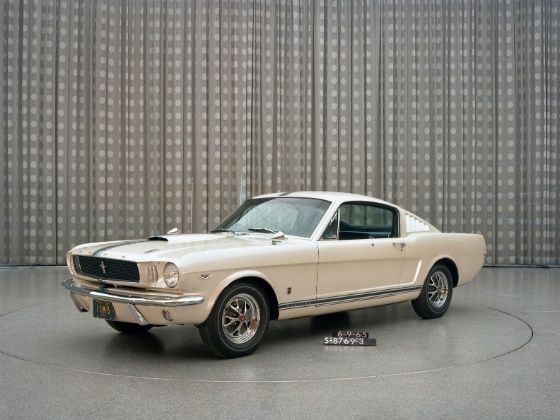 Ford sold over a million Ford Mustang in the 1965 model year alone, a world record that still stands today! When Edsel Ford II, the great-grandson of the legendary Henry Ford and the son of Henry Ford II turned 16, the Mustang team decided to treat him with a special one-off bespoke Mustang. This one-off car, was handed over to Edsel Ford II on the 27th December 1964 and featured styling that was never seen before. The car also featured a special one-off Pearl White paintjob, unseen on any Mustang at the time and featured a special blue rally stripe that run across the centre of the car. Along with the functional air scoop, the car also featured add-on European spec, front fender-mounted rear view mirrors as at the time the rear view mirror was in fact not a standard fitment but an optional extra for all mustangs sold. The car also featured the chrome package and a bespoke fuel cap with the initials ‘EBF II’ engraved on it. The Interiors too were a one-off creation by the in-house Ford Mustang team and featured matching blue leather interior and suede with an all-aluminium trim option. The car also featured the sportier alloy wheels as compared to the more popular rotary knock-off wheel trims that feature on the first ever Ford Mustang convertible. Sadly though, the car featured here was lost forever when in 1969 a friend of Edsel For II had a crash in the car having borrowed the car from its famous owner. Considering how popular the 1965 Mustang is amongst collectors, this particular car would have no doubt been one of the most sought after cars from its era.